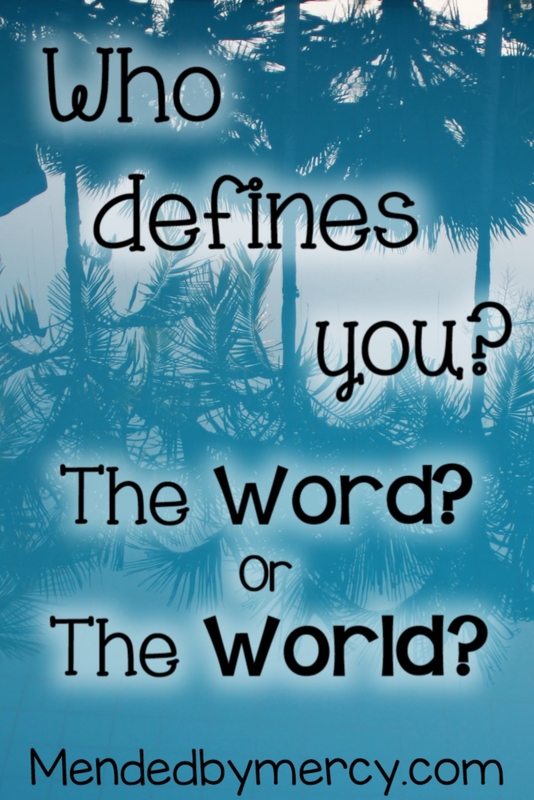 Who defines you? The Word or the World? Imagine God listening to you talk to yourself. What would He hear? What does He hear? Imagine God looking back at you as you stare at yourself in the mirror. What do you see? What does He see? Imagine God looking into your heart. You see something faulty. You see something imperfect. You see someone with a history of mistakes. You see broken. You see wounded. He sees His own design. He sees something beautiful. He sees something He perfectly created. Are you alone when those thoughts cross your mind? When you utter those words of disappointment in yourself? When you shame your body? When you let Satan drag you down into a deep pit of doubt? How much would your thoughts and words change if everything you think and say to yourself were spoken in His sight? This world tells us to be beautiful that we must look a certain way. We must act a certain way and we must be like everyone else. To be successful, we must climb the corporate ladder. Life is all about being successful, having the best things and the most money. God’s Word tells us to do the exact opposite. We are not to conform to the patterns of this world. We are not to be like everyone else. We do not follow worldly views of beauty. Yes, we want to be successful, but only if God is the one leading the success, and He can be glorified through it. This song has been a life changer for me. I have allowed the world to influence the labels I give myself. But God give’s me completely different labels. This is my story in song! I pray the words of this song touch your heart. Who defines you? The world or the Word? This is SUCH an encouragement, Stephanie. Your message both convicted me (oh those negative thoughts!) and inspired me (Thank you God for how you measure who I am!). We are His, we are healed and whole and beautiful to Him. Just think if we all believed that truth in our every thought in our every day and in our every failure moment… Oh the freedom! I’m so glad you found encouragement in this! I’ve honestly struggled with all those things that I wrote about. But there is so much freedom in no longer being a slave to the fear we allow in our lives! It’s just taking that action to really believe in Him and allowing Him to take those fears and insecurities so we can live in freedom! It’s so hard, but oh the heaviness that is lifted away when we do give it to Him! !